The Vanier Professorship is awarded to a professor at Trent who has made significant contributions to the study of Canada. It is an opportunity for the university to recognize and celebrate the achievements of one of its faculty in this area. The professorship was established in honour of Governor General Georges Vanier, who officially opened Trent in 1964. W.L. Morton and Tom H.B. 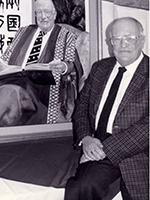 Symons were the first and second Vanier professors. The professorship is awarded by the President’s Office, for a five year period. It is supported by an endowment. The Vanier professor has access to the interest earned on the endowment, in support of activities related to their work at Trent. At the beginning of their term, the Vanier Professor gives an inaugural public lecture on some aspect of Canada. The lecture is presented at a venue outside of Trent university campuses and is aimed at a broad, public audience. At the end of their term, the Vanier Professor gives a second public lecture reflecting on their work. When their term is over, the Vanier Professor will have the title “Vanier Professor Emeritus.” During their 5 year appointment, the Vanier Professor will work with Trent’s Development Office to find ways to grow the Vanier Endowment. The purpose of the Mackenzie Discretionary Art Endowment is to provide discretionary funds annually, to support the development and care of the Trent University Art Collection.The revenue accrued from interest on the endowment is to be used for discretionary purposes each year. It may be used for any purposes that serve this end other than the hiring of staff to manage the collection. The hiring of part-time contract staff for special projects is permitted only when the term of their contract is less than one year. Decisions on the spending of the interest will be made by the Chair of the Trent Art Collection Presidential Advisory Committee (TACPAC), subject to the approval of the President. Major expenditures will be made after consultation with TACPAC. The T.E.W. 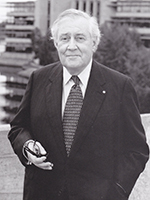 Nind Endowment Fund was established to honour former Trent President Tom Nind. This fund is to be used at the discretion of the President, and each President has set out the priorities for its use during his or her term. The current priorities for this fund are internal Trent organized activities that assist in bringing people and events to Trent or special Trent arranged projects. Applicants should be aware that the President’s Office aims to spread the available funds across our campuses, programs and stakeholders. To ensure that there is room for new initiatives, the Fund does not normally fund the same projects over more than two years. Submit a one page description of your project to the Office of the President to apply to this fund. Awards are typically in the amount of $500. Applicants are encouraged to discuss their application with the Office of the President before applying. 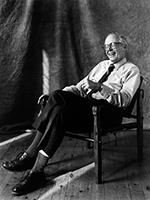 The Symons Trust Fund for Canadian Studies was established in 1995 by friends and colleagues of Thomas H. B. Symons, the founding President of Trent University, to honour and to continue his work in the field of Canadian Studies. The purpose of The Symons Trust is to support and enhance the study of Canada, especially, though not exclusively, at Trent University. Under the direction of its Committee of the Trustees, the Trust provides funding to support imaginative new activities, to act as seed money for worthy new endeavours, or to foster important long range projects. Applications, which are welcome from any and all disciplines, programmes, or individuals, are evaluated by the Trustees in terms of their originality, quality, and potential contribution to the study of Canada. Funding from The Symons Trust Fund for Canadian Studies is disbursed annually by the President of the University on the recommendation of the Committee of Trustees. Established in 1987 when Donald Theall retired as President & Vice-Chancellor. The fund supports a one-time research grant to support a junior faculty member (at the university for five years or less) or a faculty member on a Limited Term Appointment. Applicants are asked to submit a one page written document to the President’s office with details about the project along with a separate page that lists the applicant’s relevant publications and research work. Recognizing a long-standing need for a staff recognition award, the University established the Nancy Simmons Smith Award in 2008 to recognize non-academic staff members who demonstrate excellence and exceptional commitment to Trent. With the support of an endowed fund, the Award is named in honour of Ms. Simmons Smith, University secretary and secretary of the Board of Governors from 1987 to 2008. Throughout her career as a senior administrator, Nancy advocated tirelessly for the recognition of non-academic staff and their contributions to the University. The Award includes a cash gift of $500 and a framed citation presented at the "Heart of Trent" event. Established by Leo Groarke, this fund recognizes two brothers who studied and taught philosophy. 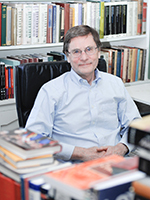 The Fund is intended to advance the study and discussion of philosophy. At a time when the importance of foundational disciplines like philosophy is often undervalued, this is a gesture that aims to support its continued importance at Trent. The fund will support the bold and free debate of philosophical issues and ideas by providing support for events which will be of special interest to students and those who practice philosophy outside of the academy. The interest from the Fund will be used to support public philosophy events that involve students, alumni and others interested in philosophy. The Chair of the Philosophy program will be entrusted with the use of these funds in a manner in keeping with the goals of the fund, subject to approval of the University President (the fund is not used to replace ordinary operating expenses for the philosophy program -- the teaching of courses, hiring of instructors, etc.). Those interested in events that may be supported by the fund should contact the Chair of the Philosophy program. The revenue accrued from interest on the endowment is to be used for discretionary purposes each year to advance and enhance the success of Trent Durham. Commitments made through the fund cannot extend beyond the year in which they are made. Decisions on the spending of the interest will be made by the Head subject to the approval of the President. The focus of the College Funds is to allow funding for the sustainability and vitality of the College system. They are discretionary funds which allow the head of each college to have flexibility in spending for priority needs. 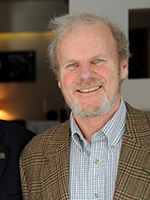 The principal of the Champlain College Endowment; Peter Gzowski College Endowment; Lady Eaton College Endowment; Otonabee College Endowment; and Catharine Parr Traill College Endowment shall be retained, administered and managed by Trent University and the Provost and VP Academic, with oversight by the President and Vice Chancellor. The purpose of the fund is to recognize the fundamental role of the Bata Library in facilitating learning for all members of the Trent community. The fund will assist the Library to enhance its ability to provide access to all types and forms of information in the years to come. Decisions on the application of the income will be made at the discretion of the President & Vice Chancellor. This is not an application-based award. The Symons Award for Excellence in Teaching is named for Professor T.H.B. Symons, the Founding President of Trent University, and is made available through the generous support of Professor and Mrs. Symons. The Award (monetary award, a Symons liripipe and a framed citation) is presented each year to a member of the Trent faculty or staff (full-time or part-time) in recognition of outstanding teaching in the broadest sense and, in the words of Professor Symons, "exemplary concern for students." The presentation of the Award is made each year at the Spring Convocation and is acknowledged in April at a celebration of Trent teaching excellence reception that is open to the university community. See the Centre for Teaching & Learning for application details. Established through a gift from T.H.B. Symons, the founding President of Trent University, to recognize excellence in performance in courses of the Canadian Studies Program. Four prizes of $250 each are awarded for outstanding achievement in the first year course, and outstanding essays in the second, third, and fourth year courses. This prize is awarded by a committee within Canadian Studies. There is no application process. Initiated by students of the 1993-94 Vanier Seminar. The Thomas H.B. Symons Seminar Series, named in honor of the founding president of Trent University, Professor Thomas H.B. Symons, is a graduate student research forum where individuals from various disciplines communicate their knowledge and research findings to a broader audience consisting of fellow graduate students, and the Trent and Peterborough communities. The series has provided a unique platform for graduate students and future leaders to share their research and raise awareness on different issues of concern See the Trent Graduate Students' Association for application details. The T.E.W. Nind Endowment Fund was established to honor former Trent President Tom Nind. This fund is to be used at the discretion of the President, and each President has set out the priorities for its use during his or her term. 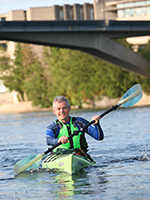 The current priorities for this fund are internal Trent organized activities that assist in bringing people and events to Trent or special Trent arranged projects. Established in memory of Professor T.E.W. 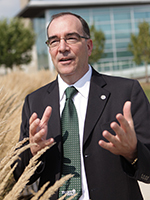 (Tom) Nind, President of Trent University. Awarded to a major or joint-major in Mathematics who demonstrates financial need and high academic standing. This award is allocated by the Financial Aid Office based upon need. There is no application process. Named in honour of the late Tom Nind, Trent University's second president. Awarded each year to the international scholar with the highest academic standing at the end of his/her first year at Trent. It carries an additional one-time award of $500. This award is allocated by the Trent International Program. This is not an application based award. It is awarded by the TIP awards committee. Established in 1987 when Donald Theall retired as President & Vice-Chancellor. The fund supports a one-time research grant to support a junior faculty member (at the university for five years or less) or a faculty member on a Limited Term Appointment. A call for submission will go out during the fall term. Applicants are asked to submit a one page written document to the President’s office with details about the project along with a separate page that lists the applicant’s relevant publications and research work. The purpose of the fund is to recognize the fundamental role of the Bata Library in facilitating learning for all members of the Trent community. The fund will assist the Library to enhance its ability to provide access to all types and forms of information in the years to come. Decisions on the application of the income will be made at the discretion of the President & Vice Chancellor. This is not an application-based award. Created as a tribute to Trent University's fourth President. Awarded by the Academic Advisor to the full-time undergraduate student member of Otonabee College with the highest average at mid-year. Named in honour of President Conolly’s active involvement in World University Service of Canada (WUSC). This award is given to a student to recognize outstanding commitment and contribution to the support of refugee students. This is not an applicant-based award. The prize is awarded by TIP. The Leonard Conolly Graduate Students' Travel Fund will support travel for graduate students in the M.A. in English Literature (Public Texts) program to conduct research or deliver their findings at conferences. For application information, please contact M.A. in English Literature (Public Texts) program . An award established by President Patterson, for students enrolled in the BBA program who engage with the community in order to develop their collaborative and entrepreneurial leadership skills. Grants of $500 - $3000 per year. For application information, please contact the Business Program. 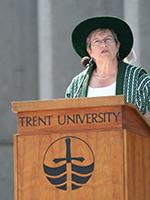 Created as a tribute to Bonnie Patterson, President & Vice Chancellor of Trent University from 1998-2009. Awarded to returning full-time undergraduate students participating in the varsity athletics program on the recommendation of the Director, Athletics and approval by the President, Trent University. OTSS guidelines apply. Established by his wife Jean Franklin (nee Simmonds) and his son, Steven E. Franklin, and supported by family and friends. Dedicated to the memory of Eric Franklin, who emigrated to Canada in 1956, raised a family of four children with wife Jean in Aurora, Ontario, and worked in the printing profession in Ontario until his retirement to Vernon, B.C., in 1995. Preference will be given to a full-time undergraduate student in the general or honours Geography or general or honours Environmental & Resource Science/Studies programs.